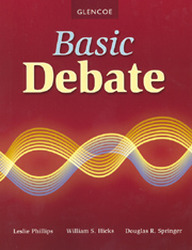 Ideal for beginning debaters, Basic Debate teaches the fundamentals of debate, from the skills of analysis and research to techniques of cross-examination and logical reasoning. Students using this program naturally develop the confidence to move with ease through many academic pursuits. In-depth coverage of the role of ethics in research, preparation of evidence, and debate competition promotes critical thinking, while an expanded chapter on Lincoln-Douglas debate brings historical perspective. Prepare students to argue clearly and effectively with complete explanations of the various types of debate propositions. Groom your students for membership in all types of organizations with a comprehensive chapter on parliamentary procedure. Make use of helpful appendixes on competing in and hosting a debate tournament, as well as on the judging process. Prepare students to argue clearly and effectively with complete explanations of the various types of debate propositions. Groom your students for membership in all types of organizations with a comprehensive chapter on parliamentary procedure. Make use of helpful appendixes on competing in and hosting a debate tournament, as well as on the judging process.